Published on Saturday, November 10, 2018. This article appears in the October/November 2018 issue of American Craft Magazine. Pussyhat Project co-creator Kat Coyle made a simple blanket pattern that leaves plenty of room for personal touches. Not many museum exhibitions open with an empty gallery. 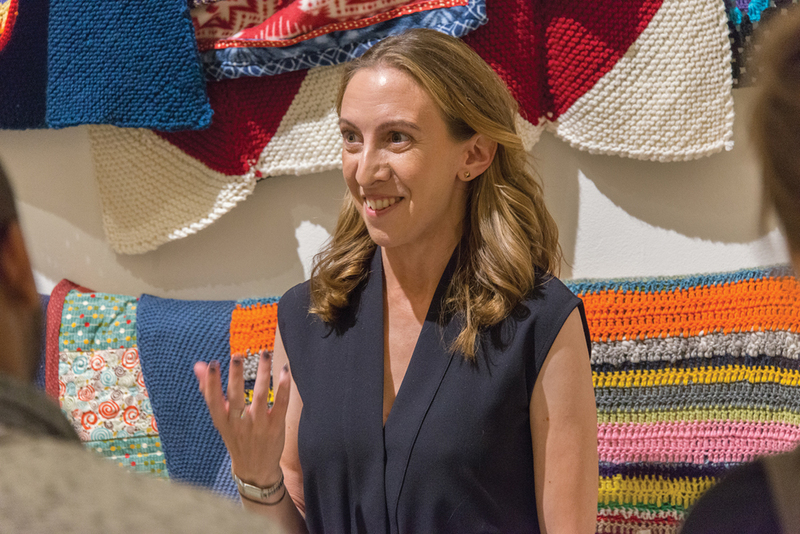 But a blank space made sense for “Jayna Zweiman: Welcome Blanket,” which made its debut at the University of Chicago’s Smart Museum of Art in mid-2017. 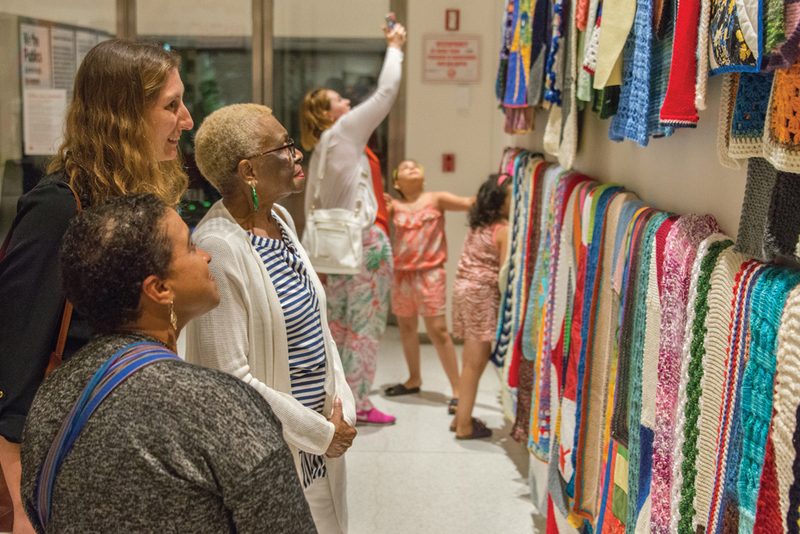 Gradually the gallery was filled with donations from makers around the country: knitted blankets in the colors of the American flag, a quilt with brightly colored appliqué hearts, crocheted blankets featuring squares of soothing pastels from scrap yarn. When the exhibition closed at the end of the year, the walls were full, with piles of additional blankets on tables – all of which would eventually be sent to immigrants arriving to the US. Welcome Blanket is an ongoing project, and since its inception in early 2017, it has collected more than 3,500 blankets donated by makers across the country for immigrants, particularly refugees. The project recently made a second stop at the exhibition “Making Change: The Art and Craft of Activism” at the Museum of Design Atlanta, and an exhibition at Los Angeles International Airport is in the works. “My goal is to turn this into an American tradition,” says Jayna Zweiman, founder of the Welcome Blanket project. Visitors attend the opening of the Welcome Blanket exhibition at the University of Chicago’s Smart Museum of Art. Then, when an executive order closed the nation’s borders to refugees and citizens from seven predominantly Muslim countries in late January 2017 (a modified version was eventually upheld by the Supreme Court), her desire to show support for immigrants grew even more urgent. Zweiman imagined the length of the proposed border wall as a space for handcrafted blankets – symbols of welcome and inclusion for a suddenly ostracized segment of the world’s population. She began reaching out to refugee resettlement organizations about donating blankets. Pussyhat Project collaborator Kat Coyle created a simple knitted blanket pattern and made a printable form to accompany each blanket on which makers could share their family stories of immigration or displacement and write a message to the recipient. The goal was to collect enough blankets that the total yarn used would equal the length of the US-Mexico border – roughly 2,000 miles, or an estimated 3,200 blankets of 40 by 40 inches. Alison Gass, executive director at the Smart Museum, quickly committed to an exhibition. Zweiman and a team of volunteers spread the word through social media, and donations poured in. The team asked that the blankets be a standard size, and they provided knit and crochet patterns, but donors could also choose their own patterns and materials, resulting in blankets with stripes, quilted chevrons, and knotted fleece printed with cartoon owls. The notes that accompanied the quilts often moved gallery visitors to tears. “Some are about falling in love, others are about fleeing,” Zweiman says. “Some wrote about the pain of not knowing their family’s history, because their ancestors came to the US through the Middle Passage” when enslaved Africans were shipped across the Atlantic.